The first snows of the season hit some upper reaches recently, making me realize the time may be drawing short for finishing up the Grand Tour. With a few days of pristine weather prior to the end of my vacation, I finished the north section in one push of 33 miles and 10,600 feet of elevation gain and loss. After hiking for nearly a week in so so weather (Alpine Lakes), this day, Wednesday September 9th, proved to be one of the most incredible and satisfying days I have spent in the mountains. If I had one word to describe this experience it would be Glorious. Grand Tour Part 3 photo set here. For my long day I chose to start at the White River campground and proceed up the Glacier Basin trail to Glacier Basin. From there I easily crossed the Inter Fork of the White River by rock hopping and proceeded to scale the ridge further right, skirting some cliff bands but attaining the ridge higher than the usual climbers trail, which I used for the descent. 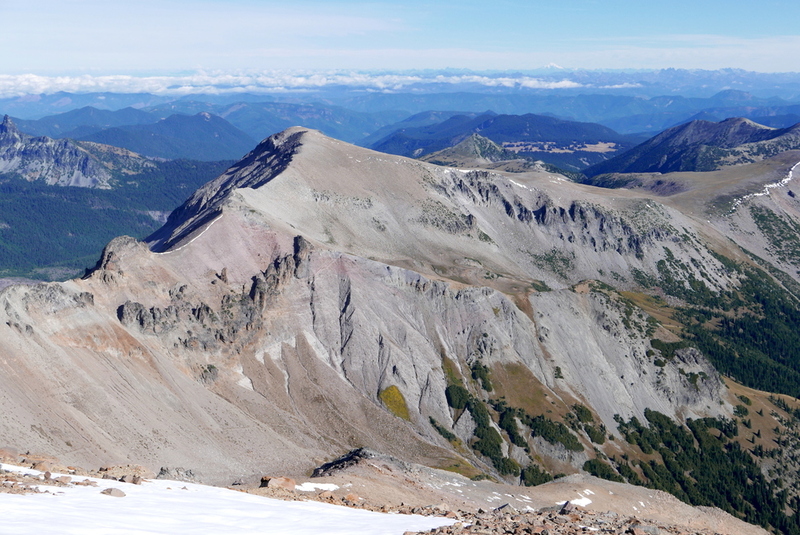 Some fresh snow deposits on Ruth were easily negotiated in my trail runners and I enjoyed solitude on this summit with 360 degree views, spying many points (such as Goat Island Mountain, Banshee etc) that are also on the Tour. The Emmons Glacier is so massive that no camera can capture its immensity, nor can panos do the view justice in any direction. This is truly a place that needs your eyeballs for it to sink in. I finally tore myself away from the summit to proceed up the spine towards Steamboat Prow but was met by a rocky barrier barring access to the rest of the ridge. It seems the other times I have been up here I came via the Inter Glacier so perhaps hadn't noted this. I descended at this point a bit to see if I could scramble around but quickly decided that I should bag it and head back. It is still worth it to hike the spine this short ways to look back on the dramatic side of Mt. Ruth and stand approximately 60 feet higher than the Ruth summit. From here on it was downhill mode and I quickly found myself back at Glacier Basin and ready for the next ascent to Third Burroughs. This is all on trail and the view from Third Burroughs allows you to glimpse the other spine of Steamboat Prow and gaze upon the equally impressive Winthrop Glacier. I looked towards my next objective, Skyscraper Mountain, and scoped a cross country route that would take me there. This off trail section went without much difficulty and once I attained the open ridge it was an easy walk to intersect the Wonderland Trail at Skyscraper Pass and follow the obvious tread to Skyscraper Mountain. Once again I had the summit to myself and enjoyed equally impressive 360 degree views, spying more points on the Tour. From this point I joined the Wonderland Trail with the aim of making Mystic Lake before nightfall. The only glitch in my plan was a socked in Curtis Ridge, where I have been many times before, and I decided to skip foggy nighttime cross country travel here with questionable returns. I was carrying everything I needed with the plan of attaining Curtis Ridge and snoozing until sunrise for photo ops, then hiking out to be done before noon, but I decided to skip right to the return to reacquaint myself with endurance hiking and star gazing. It made for a long day but extremely satisfying being able to pull off this hike in this age 60 celebratory year. Whether I can finish the last part of the Tour (South) before winter sets in is up to the vagaries of weather and schedule. Once complete I will publish more particulars and possible ways to connect these hikes for the intrepid backpacker who wants to experience this park in ways far beyond the Wonderland. Stay tuned.